Golf is one of the most popular amateur sporting activities however from a fitness perspective almost totally neglected. Most casual players make it to the course in the nick of time; head for the tee block and with the most perfunctory of practice swings blast the ball of the tee hoping to drive the ball into the next county. Some may do so without injury but many do not and few golfers appreciate the importance of golf fitness. This is not only for injury prevention but imperative in improving their game and the overall enjoyment of it. You may ask why I would prepare a blog this late into the season to address the nuances of golf. Well I did mention exercises in spring however a short pencil is better than a long memory. In other words I am finding a plethora of injuries this late into the season. Often it comes with the company tournament where peacock feathers are in full plume. Golf is actually a very physical sport. It requires considerable heart and lung endurance to withstand general fatigue and enable a golfer to maintain rhythm and alertness over a long 18 holes. Strength is needed especially in the back, shoulders, knees, pelvis, wrists and hands. Flexibility is required in the hips, pelvis, shoulders, arms, and lower legs. To drive off with full power without proper conditioning at the start of the day, especially in colder weather, is to ask for muscle aches, pains and strains. Warming up should include stretching exercises, focusing in the back and legs. This should be succeeded by some two club singing and then a 10 minute practice starting off with a short club to establish rhythm and loosen tight muscles. Golf is a one sided cork screw sport so additionally I suggest every three tee blocks or so take three of four swings the opposite way to uncork yourself and the low back muscles. 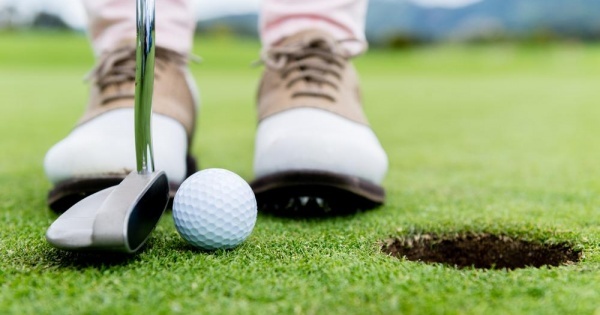 There are a host of injuries common to the game of golf that include wrist spains, Golfer’s elbow, Sacroiliac syndrome, Sciatica and a host of other low back and leg injuries. Golfer’s Elbow is usually felt on the inside of the elbow rather than the outside of the elbow common in Tennis Elbow. It is often due to a combination of improper mechanics, overusing the muscles around the elbow during the follow through of the swing, and gripping the club too tightly. Treatment may include specific exercises, massage, ultrasound, trigger point therapy, electromagnetic therapy, TNS, as well as ice and heat protocols. These are determined after proper evaluation. Knee Sprain is common among golfers with the rotational sheering that happens with the swing phase. After improper torsion and walking over uneven terrain one can aggravate the knees. If the causation is from the swing pattern perhaps a consultation with golf pro to evaluate your mechanics is in order. Many injuries can be avoided by implementation of a basic programme to promote flexibility. We have a great exercise that not only improves flexibility but improves accuracy and if done on a regular basis will take strokes off your game. That exercise works on muscle memory and reduces the mishits and duffs. I will be happy to show you the exercise in the office. I wish you all the best in your golf season and remember to implement the exercise protocols to avoid injury and improve your game.